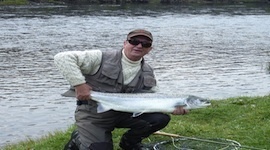 The River Spey is one of the most productive salmon rivers in Scotland. Tulchan Water is acknowledged as the jewel in the crown. Tulchan Water is acknowledged as the jewel in the crown on the River Spey, with Eight miles of river offering a rich variety of sport in the beautiful setting of Tulchan Estate. The four beats, each limited to six rods, are tended by the expert care of their own ghillie. On the banks, luxurious cabins provide rest and relaxation for fishermen. 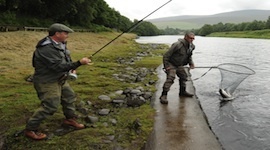 Europe’s leading Trout & Salmon magazine describes Tulchan Water thus: ‘Unquestionably some of the best salmon fishing in Europe.’ ‘If I had a choice to fish anywhere in the world in June, the Tulchan water of the Spey would probably get my vote,’ writes Editor Sandy Leventon.